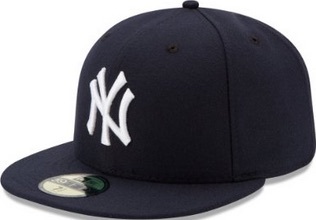 As arguably the biggest franchise in all of professional sports, the New York Yankees fan base extends across the globe. With all these supporters, the Yankees are among the most collected teams of all-time. Chances are good that a close family member or friend is a fan of the Yankees and armed with that limited information, we have made buying a holiday or birthday gift much more simple. This guide is designed as a resource for those that are lost in the sea of Yankees' gear and memorabilia. Collectors and fans looking for a more detailed guide can check out our comprehensive Yankees collecting guide here. 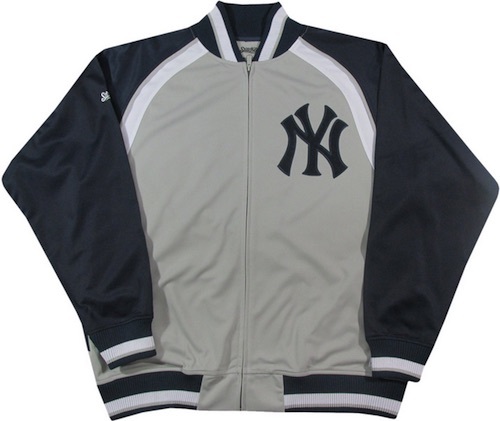 The following list includes a good supply of gift options that are specifically relevant for fans of the New York Yankees. Both broad suggestions and specific options are provided and the price points extend to most shopping budgets. 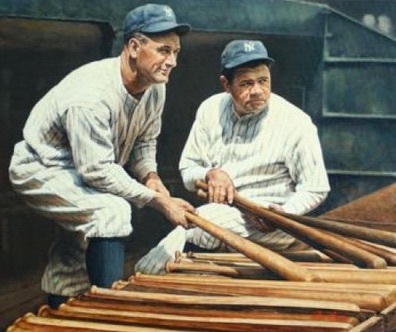 Featuring two of the most storied figures in the history of the Yankees and Major League Baseball, this beautiful canvas print perfectly captures Lou Gehrig and Babe Ruth in a more relaxed moment. While his professional career has ended, Derek Jeter remains the face of the modern Yankees. This is perfectly memorialized with the "Farewell Captain" collage that features four different images from the end of Jeter's career. 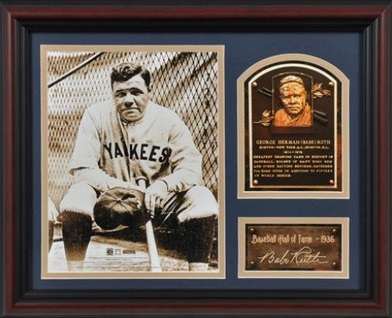 Babe Ruth is one of the biggest names in the history of the game and some of his memorabilia can run well into the six-figure range. This attractive collage is more of a budget piece, but still has a premium feel thanks to the Hall of Fame plaque and frame. There are several additional options for Ruth at the link above. 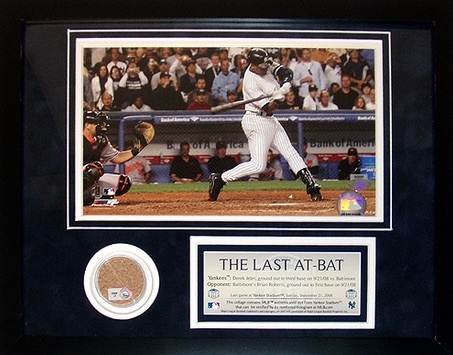 Not simply stopping at an image collage, "The Last At-Bat" also includes a small capsule of dirt from the site of Jeter's final at-bat versus the Baltimore Orioles. Official dirt is a common theme for other Jeter items and can be seen here. Yogi Berra is a New York legend and most collectors would love to own a signed photograph of the Hall of Fame catcher. 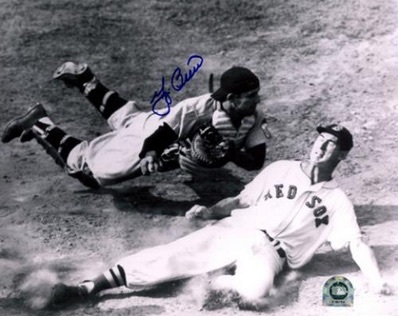 In addition to the photo shown below, there are plenty of other signed photos available for the former great. Like Berra, Mickey Mantle holds a special place for fans of the New York Yankees. 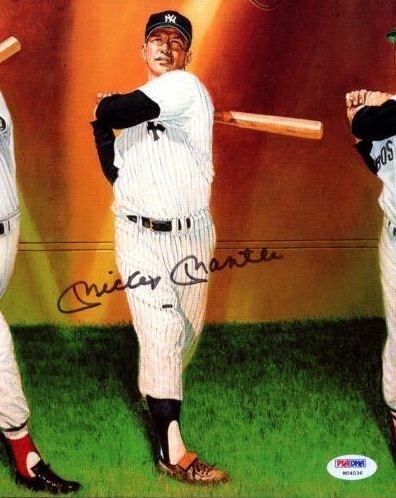 His autographs values check in a bit higher given that he passed away in 1995, but there is still a decent supply and several versions can be seen at the link above. Mariano Rivera ended his career as a Yankee and was dominant throughout. Other than Jeter, Rivera is the most popular modern Yankee for fans and collectors. There are plenty of choices and a signed jersey would be high on the list for many super fans. If that is a little too steep, other signed options for Rivera can be seen at the link above. Derek Jeter is one of the most celebrated players in the last few decades and remembered most as "The Captain" of the New York Yankees. 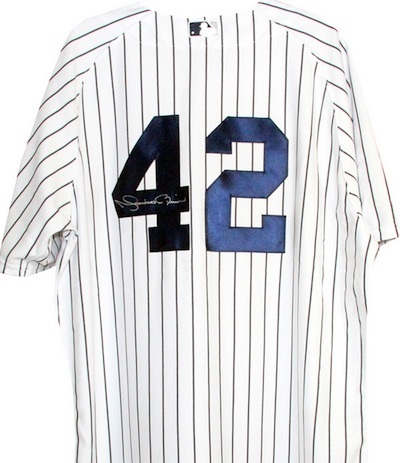 Anything signed by Jeter would make a great gift, but a signed baseball tends to be one of the most preferred present for fans and collectors. 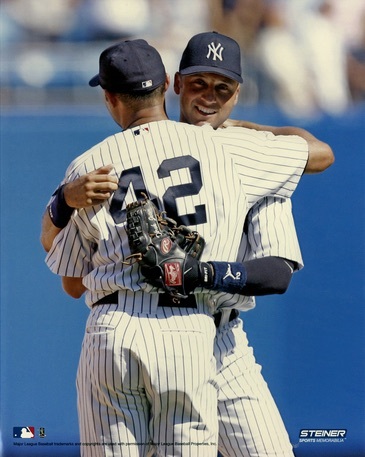 This photo of Rivera and Jeter keeps things simple with a hug between teammates. The budget option would be a great item to have signed or to simply display as is. 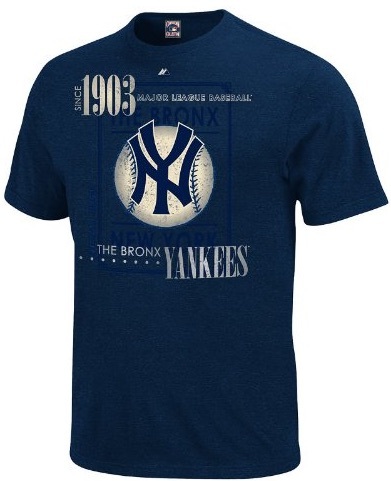 Older fans are well aware of the original Yankee Stadium which remained in use from 1923 until 2008. 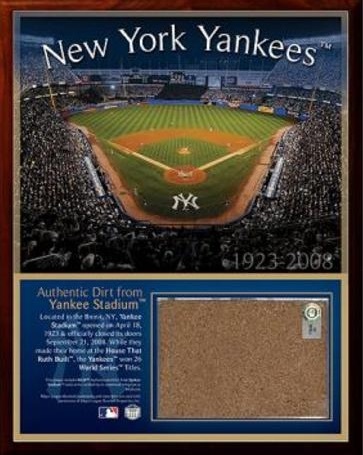 Although it was later demolished, fans and collectors of the team can continue the legacy of the historic stadium with a collage that features authentic dirt from the inaugural season. 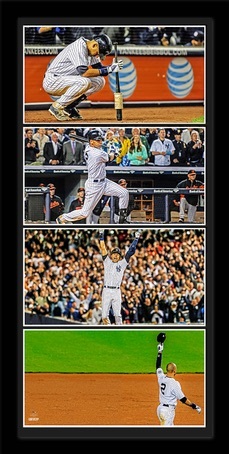 It is easy to forget just how successful the Yankees have been. 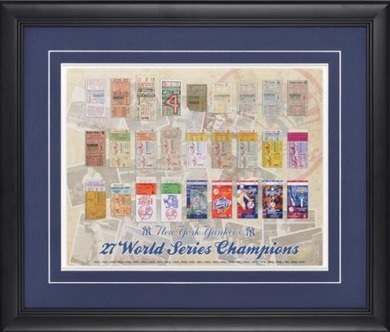 The team has amassed 27 World Series titles and a fan that is also a historian would especially appreciate this collage that covers all those championship teams with a replica ticket from each World Series win. With four titles in five seasons, the Yankees of the late-1990s were a dynasty. This subway sign pays homage to that team with a listing of all the players that were on the roster for each of the four World Series wins. There is also a small capsule of game-used dirt. Baseball cards are a popular option for fans, but they are not as simple to buy because they are so specific. 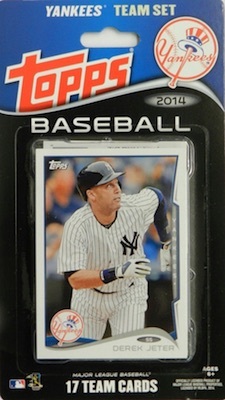 One option we recommend for budget gifts or stocking stuffers is New York Yankees team sets. Some are sealed and some are hand-collated, but the result is the same. Make sure to verify the year of the card and the players included to make sure you are getting what you expect. Figures have certainly picked up steam in recent years, and the Yankees offer some of the most popular options. In addition to bobbleheads and various statues, companies like Starting Lineup and McFarlane offer an extensive look at some of the most popular players from the franchise. The links below will let you shop specific figures on eBay. 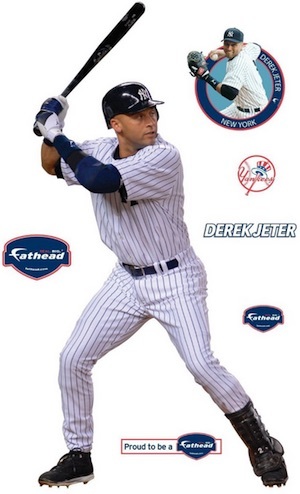 There are a good variety of different New York Yankees team fatheads. In addition to team logo versions, players are some of the top Fatheads and three of the most popular Yankees are noted below. Smartphones are the new norm and can make for an easy and inexpensive gift for a New York Yankees fan. Just make sure to verify the exact make and model before you buy. We have included direct links to Amazon below for the most popular phone models. 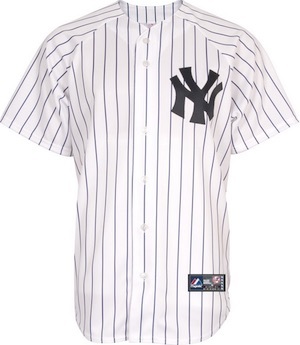 Jerseys remain the most common way for fans to display their love of the Yankees. Replica versions offer cheaper prices and fans can also have them customized for added appeal. If you are overwhelmed by the many versions, check our detailed MLB jersey guide here.